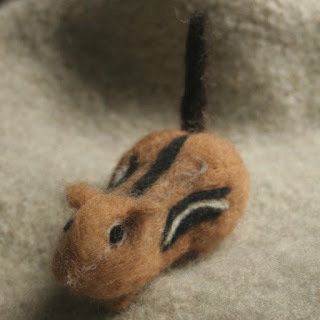 It seems each year when our chipmunk comes out of hibernation I need to make at least one to celebrate. 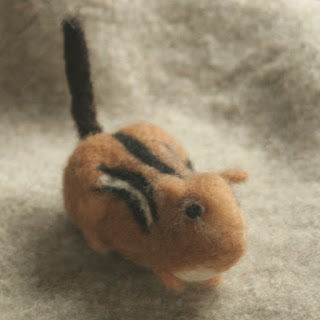 So here's this year's needle felted spring chippy. If you'd like to see more views of him, and you're on Ravelry, look for my notebook under my Ravelry name, thanksforwool. Or you can see him in my Etsy shop. It's been raining here for almost 3 full days. The streams are just about full and so are the wetlands. They say it'll be nicer tomorrow. I hope so ~ I want my walk, and I don't do much walking in the rain! Very cute little guy. So, you are all wet also? Can you believe this storm? It's nice to finally see the sun this morning.